Watch a few videos of Henry Rollins on YouTube and you’ll notice something – the man has some pent-up aggression. Whether he has reasons for it is not for me to say (although it usually seems like he does). But I will say this: Henry Rollins is intense. And his aggression comes out in many ways, sometimes insultingly, sometimes humorously , and sometimes sublimely tragically. But that is one of the interesting things about Eye Scream. Rollins’ blurb seems at odds with the book. The style of his explanation is focused, while the book is all over the place. In his spoken word stints, Rollins has a talent for being poignant, but funny and edgy at the same time. In Scream, on the other hand, Rollins is ranting and rambling, shocking but without context. And worse of all, it is repetitive. Or so I thought. The amazing thing about Eye Scream is how my opinion changed while reading it. At first, I felt it was shocking just to be shocking. There seemed to be no rhyme or reason and certainly no structure. After about sixty pages, I went online to see if the story was going to get anywhere. That’s how desperate its insanity had made me; how much I felt like I was falling down a pointless rabbit hole. Fortunately, except for Rollins’ review (which certainly helped), I didn’t find anything else online because after plugging away at Eye Scream, I began to realize a few things. The repetitiveness of the rants, which seemed to be the book’s major fault when I started reading it, is actually the most powerful aspect of the work. I believe repetition can sometimes breed complacency, or numbness when it comes to repetitive accounts of shocking stories. This then makes you wonder how such shocking things can have no effect on you. Think about how much thought or emotion you devoted to the earthquake in Haiti compared to the earthquake in South America (donate here). But the repetitive articles in Eye Scream, which make you feel almost nothing, stand in stark contrast to the ones that are really powerful. You wind up plodding through the mud when BAM! you’re hit by an article that fires on levels. And I mean that. There are some very amazing, concise, and revelatory parts of Eye Scream. The only bad part about the book is that most of the rants are so raw that they verge on being simplistic, which in my experience is not typical of Henry Rollins. And yet while the insight that is encouraged here is raw and emotional, rather than intellectual and calculated, it causes the after shock to be profoundly self-reflective, as if the extrovert of the narrator brings out the introvert of the reader. The shocking nature of some of the rants makes reading Eye Scream akin to watching Requiem for a Dream. In a way, I’m glad I experienced it, but I would not want to experience it again. 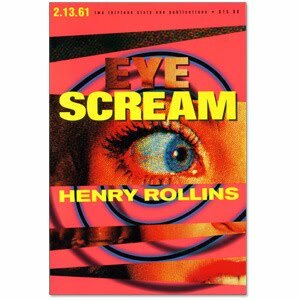 In Eye Scream, Henry Rollins yet again caused me to think, only this time it was in a totally different way. Instead of mixing facts with his own opinions to lead me to a conclusion, as is common in his spoken words, his book made me open my own eyes. Up next: Consider Phlebas by Iain M. Banks. Check it here. This article first appeared on Better Than Sliced Bread.